Brings Spider-Man as he appears in Infinity War to GTA: San Andreas. Adds vehicle customization from GTA 5 to GTA San Andreas. This pack supplies some serious updates to a bunch of classic and cool cars. Between cars like Lincoln Continental, Chrysler NY, Plymouth GTX, Chevy Impala, and more getting added with some excellent textures, there are also tons of customizable options including plates, suspension, low rider body kits and more to ensure you'll be riding around in some old school style to with plenty of variables to suit your taste. This mod offers a bit of a playground that will give you just about everything worth having. It adds numerous bonuses near the Grove Street residence, including oysters, horseshoes, snap shots, a few good bikes, a fast car, and some weaponry. Ballas and Groove Family members all ride in new, better vehicles, the barber shop has most hairstyles and tattoos, and you can rework most vehicles. Looking to put an extra flash of style on much of your firepower? This mod reskins many of the regular weapons in the game with updated looks and textures. In addition, there is room to make modifications to each of the guns as well in order to fine tune their performance to your specific liking. 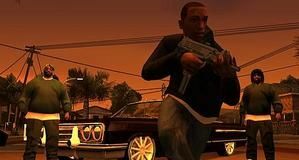 Apparently somewhere in the development of GTA: San Andreas, players were supposed to be able to go to war with any of the gangs in the game, including some that were cut. Unfortunately, in the vanilla game, you'll only fight it out with two. This mod restores that original expanded functionality so that you can initiate wars with any gang and take over their turf, eventually leading to control of most of San Andreas. This mod takes aim at several visual and mechanical improvements to make gun play in GTA: SA a bit more realistic without making it unfair. In particular, it removes dual-wielding in favor of making the player get in double-hand stance with the uzi, tec 9, pistol, and sawed off. Damage has also been increased while accuracy has been lowered across all weapons. This is an addon for the California MegaMod version 3.0. It translates some minor Spanish text to English. When Earth's water supply becomes infected by a persistent parasite, what do you do? When these parasites grow and need human flash to survive, leaving behind rotting zombies, what do you do? This mod takes place in a post-apocalyptic era, where zombies roam free and man is divided between the strong and the weak. This is one of the most massive mod for any game ever created. With approximately 6 GBs worth of content, it stretches the boundary to what a mod can do. It is mostly a compilation of various individual mods found throughout the internet, but also adds some unique touches from the author. It's split into 14 parts; be sure to grab them all.